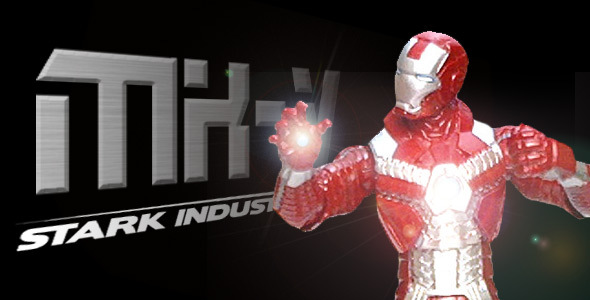 The Mark V Iron Man armor was released as part of the second wave of figures in Hasbro’s Iron Man 2 toy line. 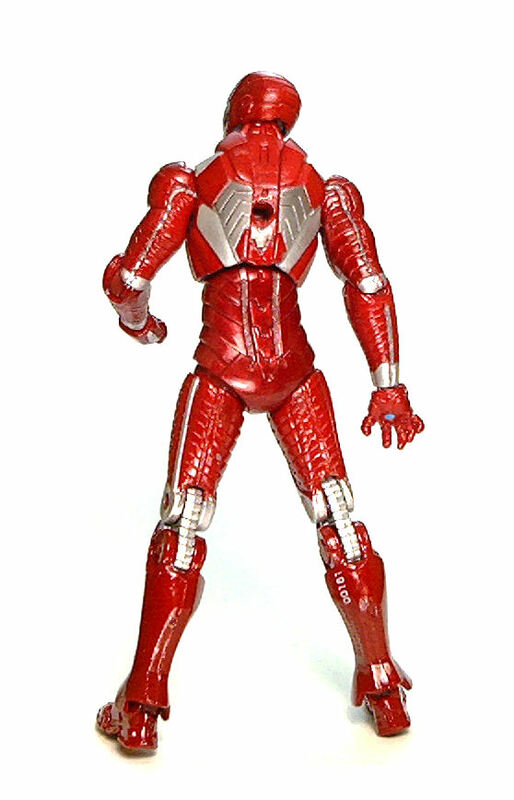 This figure represents the briefly seen (and utterly cool) portable suit Tony Stark uses in the second Iron Man movie. The concept behind the Mk. 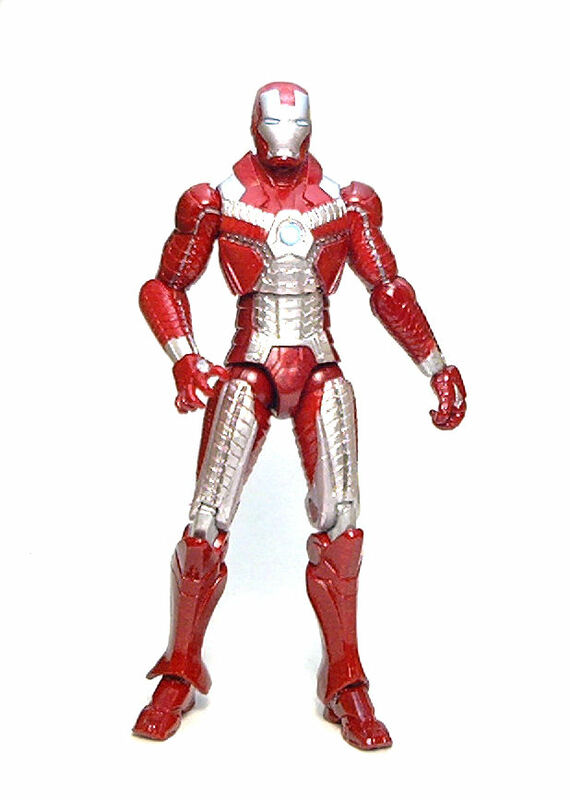 5 Iron Man armor is fairly simple. 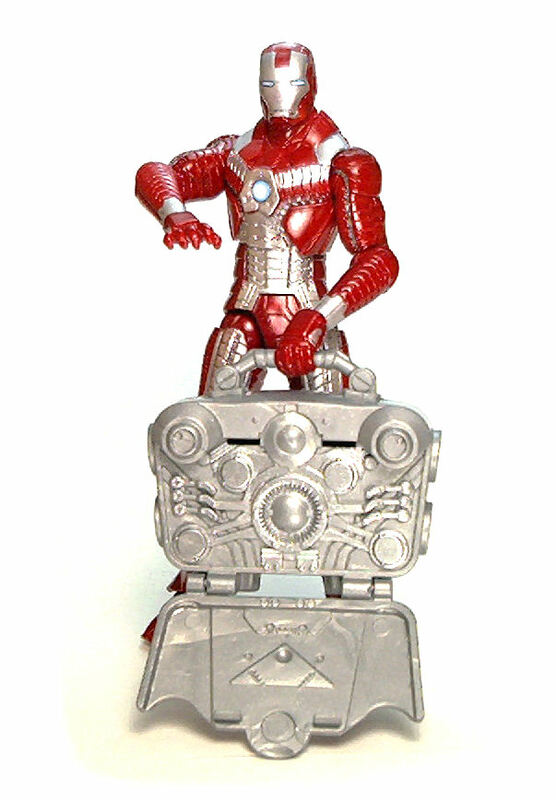 Regular Mk.3 Iron Man armor is not that easy to transport nor conceal, therefore Stark developed a bare-bones version that can be lugged around in the form of a large suitcase. The design is very sleek and slim, yet it has an astounding level of sculpted detail. 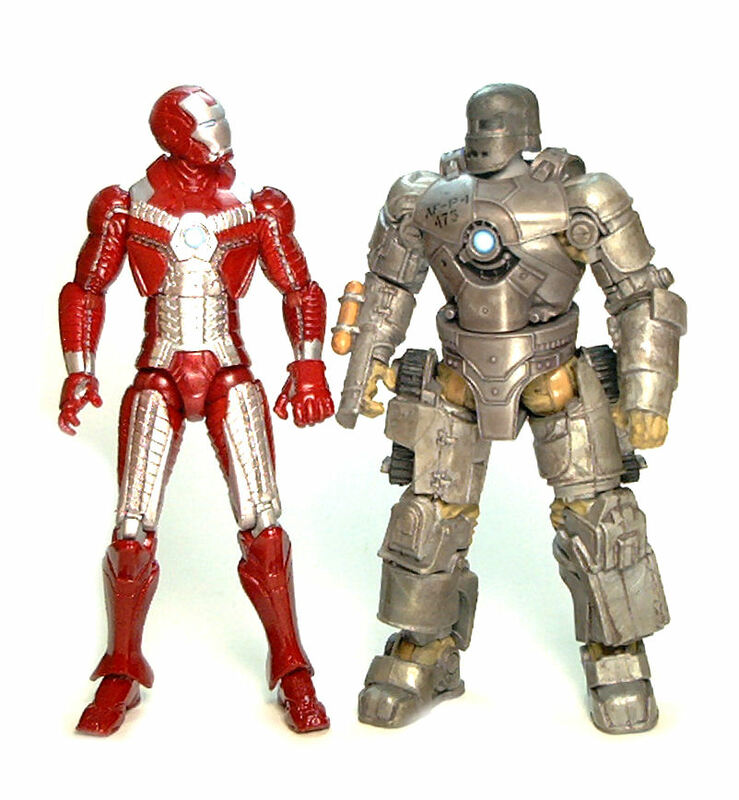 While the regular Iron Man suit is comparable to plate armor, the Mark V suit is akin to lamellar plate, being conformed of a lot of small strips of metal interlocked together. • Ball jointed neck: Works only as a regular swivel, with absolutely no tilt in any direction. • Peg & hinge shoulders: Acceptable. The shoulder rotates freely, but can only move outwards up to 15°-20°. • Hinged elbows: Perfect over 90° bending range, as well as 180° sideways swivel. • Swivel wrists: No problem here whatsoever. •Floating torso: Excellent swivel and tilting all around. Slightly loose, though. • Ball jointed hips: Limited range here, not really capable of sitting poses, but outward range is good. • Double hinged knees: Both work perfectly. • Peg & hinge ankles: Excellent range on these, despite the shin design. So, for a figure with no bulky shoulder/thigh pieces, the limited motion range was something of a let down, especially next to the Mk.2/Mk.3 designs, but there is still enough to go by. 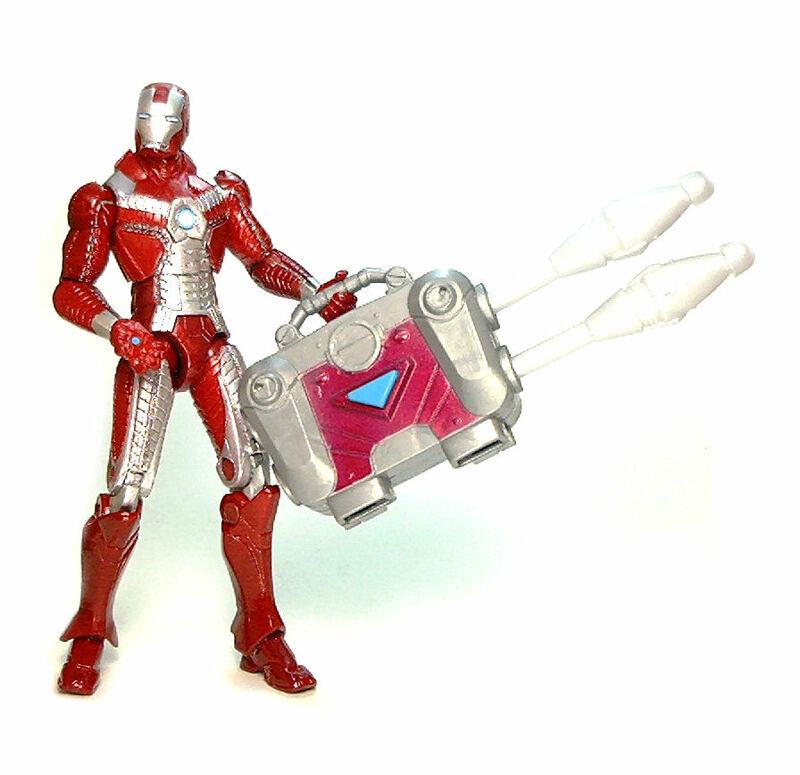 The Mk.5 suit comes with an extra left hand, designed to grab the included suitcase (or any other suitable accessory). Oddly enough, instead of the regular wrist design with the male peg sticking out of the hand piece, this time the peg is part of the forearm, with both left hands having the corresponding peg hole to attach them. 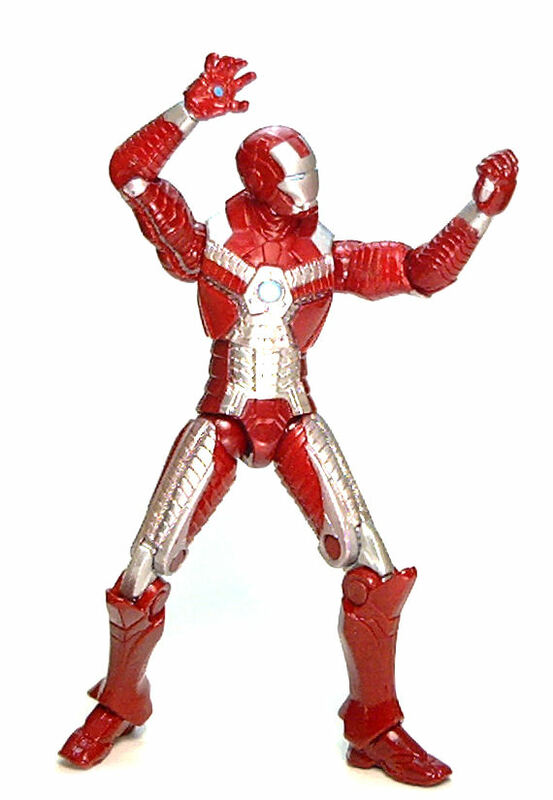 This also means that the hands cannot be used with any of the other Iron Man figures in this line. 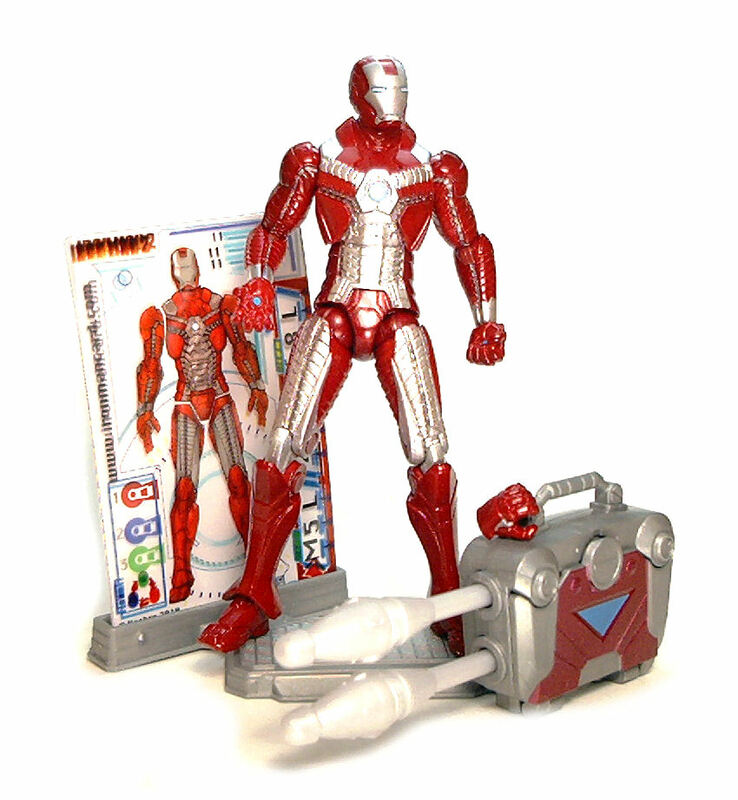 The suitcase is the gimmick piece for this Iron Man suit. Of course it cannot transform into anything, so what it does is launch the two included projectiles when the blue pyramid on one side is pressed. This mechanism is set so you can launch the missiles one by one or the two simultaneously depending on how hard the button is pressed, even though the range is fairly limited. Not content with the launcher gimmick, the side opposite to the launch button has actually an opening lid that shows the simulated high tech interior of the suitcase. Not something I was expecting, but a neat extra that might squeeze a little more use from the suitcase as a prop. The paintjob on my figure was almost perfect, with only minor issues, mostly consisting on the odd silver paint splotch over the bright red finish. The paint o the suitcase, on the other hand, is definitely something of an eyesore. The paint masks look reasonably straight for mass produced items, but the red on it is more like a hot pink than cherry red, making it look out of place. Also included are the nicely sculpted techno-grill display base and the corresponding trio of armor cards. I definitely like the sleek look of the Mark V Iron Man armor and the silver/red color scheme works great in adding a little variety to my IM2 display. I meant to comment on this the other day when this was posted. The silver on yours seems a lot more consistent than the ones I’ve seen in person. I’d picked up one to look at it last week at Wal-Mart and the silver on the upper torso looked thin in places with red bleeding through. In fact, I think the silver paint on mine was a little too thick, as a couple of lines at the chest were almost filled in with it. I guess I was just lucky, but yes,with these figures even the smallest error looks way too conspicuous.